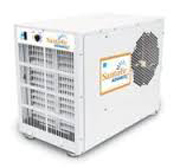 The Santa Fe Advance 2 Dehumidifier is a new model from Therma-Stor for medium and large sized crawl spaces. The model it replaces, also named "Advance", was a popular and highly regarded unit and its replacement is even better. Improvements include smaller overall size, increased air flow, higher energy efficiency (i.e. lower power consumption for the same water removal capacity), a fan which can be set to run continuously or only when the unit is dehumidifying and reduced noise output. The Advance 2's only disadvantage is its greater weight but this reflects quality enhancements that have delivered improved efficiency and quieter operation. Since its introduction substantial numbers of this model have been sold and there are now plenty of consumer reviews available to help you with your research. Inevitably some users have had problems but the large majority are more than satisfied with their purchase and I have every confidence in recommending the Advance 2 for any crawl space or basement not exceeding 2,200 sq. ft. The Advance 2 is described as a crawl space unit because it is designed to fit within the limited headroom usually found in these cramped areas but it will be equally effective in a basement. If you need a unit with a little less power than, for example, the Santa Fe Classic this model is well worth a careful look. Of course there is a down side, the far higher initial outlay, and this type of unit may be beyond your means or simply appear to be too expensive. On the other hand the higher ticket price is offset by the large energy savings and the longer life of the appliance. The Santa Fe Advance 2 is suitable for crawl spaces and basements of up to 2,200 square feet in area with an ambient temperature typically at or above 49°F. As I mentioned earlier there are now plenty of reviews by owners of this model to help guide your choice. As you will see there are many satisfied users out there who appreciate the greater effectiveness of this model (compared with standard portable units) and the enhanced protection it offers to their homes. Ignoring the inevitable "niggles" the most serious complaints are about high energy use and examples of poor after sales service from Therma-Stor. Balancing these complaints are the reviewers who have excellent service from Therma-Stor when reporting problems and those whose energy bills have been reduced since purchasing this machine. To complete the picture you may wish to visit the page on which the previous model is reviewed both to compare the specifications and to see a how the earlier model was rated by users. The Santa Fe Advance 2 is a considerable improvement on the earlier model. The two most important advantages are its lower operating cost and reduced noise. While the majority of customer reviews are positive the negative experiences of some users which I mentioned in the previous section deserve comment. The poor after sales service cannot be dismissed. Even if only a small proportion of customers have experienced this the manufacturer should address this perception. It is true to say, although no excuse, that this fault is found to a greater or lesser extent, with all manufacturers. The issue of energy efficiency is more complicated. The maximum energy saving will be achieved when the temperature in your crawl space or basement is between 50 and 65 degrees F. If your basement is warmer the difference may be marginal; if your basement is colder the Advance 2 is a poor choice and you can only use a unit designed to operate at temperatures as low as 33 degrees, such as a water damage restoration dehumidifier. Despite these reservations I believe that the Santa Fe Advance 2 is an excellent dehumidifier and I have no hesitation in recommending it to our visitors.